I have fallen in love with a travel website. It’s called CheeseWeb, and it’s a blog dedicated to “slow travel.” Slow travel is staying in one place for longer periods of time while you’re on the road and having full experiences in each place you stay. When I stumbled upon it, the incredible photos and gorgeous design of the site made my mouth water. As an armchair traveler, it has now become one of my favorite travel sites. One of the reasons why the site appealed to me during my first visit was CheeseWeb’s amazing “Start Here” page. By the time I was finished reading the “Start Here” page, I had become a die-hard fan of the site’s main writers, Alison and Andrew. Since becoming a fan of their site, I’ve noticed more “Start Here” pages on various sites around the web. 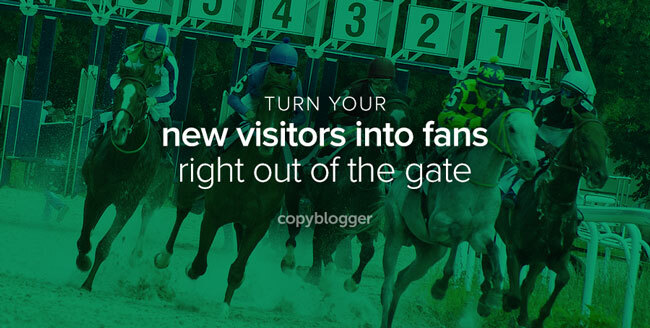 I’m now fascinated with this effective way for content marketers to create fast and valuable bonds with new readers who cross their paths for the first time. Let’s talk about what a “Start Here” section is, why it’s important for your digital business, and how to turn yours into a high-converting page. A “Start Here” area is a page on your website that helps people have the best possible experience on your site. It assumes that people don’t know who you are and have never visited your site before. It also gives them a brief introduction to your site’s purpose and exactly what their next steps should be. That’s a big job for one page, right? But “Start Here” pages do that job beautifully (when they’re done well) and that’s why they’re so powerful. It’s important to have a “Start Here” page on your site because website visitors — especially new visitors — are often like timid little birds when they land on your virtual real estate. They’re cautious and looking for any opportunity to fly the coop, so you need to be gentle with them. Your “Start Here” page allows you to be a patient, nurturing, non-threatening tour guide who’s on duty 24 hours a day, 7 days a week. But your “Start Here” page never needs to take time off. It’s on duty forever and waiting to give new visitors a great experience, every single moment of every single day. A “Start Here” page might also be called “[Your Site Name] 101,” “Begin Your Journey,” “Getting Started,” or any other name that informs new visitors that the page is an initial jumping-off point for your site. Regardless of what you call it, a great “Start Here” page can earn you repeat visitors, convert more visitors into subscribers, increase your social media following, and bring in more sales. Here are seven elements you should consider including in your own “Start Here” page. You don’t necessarily need to include these elements in this order, but make sure your “Start Here” page is organized in a clear way that takes your reader on a journey from first-time visitor to educated site veteran. To avoid confusion, briefly define key terms you frequently use. If you’re a solopreneur, this will include your individual story (and might include details about why you started your business or website). If you are a larger business, you can explain the origin story of the business and talk about the mission of your company. Keep this story brief — you can use your About page to give more details or publish your official bio. People need to know whether the information on your site will benefit them. They want reassurance that your content will meet their needs. Show that you understand your ideal visitor’s issues and problems, and let him know he’s in the right place to get solutions. Your “Start Here” section is the perfect place to link to your best content — especially your best resources for first-time visitors. Don’t go too crazy here. You want to include enough links that new visitors will find value and get lots of information, but not so many that they get overwhelmed and click away. Consider organizing your links into categories if you have a lot of them. Put yourself in the shoes of a new visitor and choose categories that make sense for that person. Your “Start Here” page should always include a strong call to action, so use that CTA to ask people to join your email list. Explain why they should sign up and possibly offer a tantalizing incentive. If you’re active on any social networking platforms, you can include links that allow people to connect with you on those platforms. Clearly label the links and include directions on how to connect with you. If you have an entry-level product, consider offering it on your “Start Here” page. Include this offer toward the bottom of the page. Discuss the benefits of any paid product you offer here in detail, so the reader knows why it’s a good place for them to start. You want to avoid scaring away your new visitor and sending the message that you’re just trying to make sales. Where should you put links to your “Start Here” page? Here are three options. Your visitors will naturally look at your navigation bar when they start browsing through your content, so put a link to your “Start Here” page in that bar. The “Start Here” or “Getting Started” button lets people know exactly where to begin on your site. CheeseWeb’s home page has a “Start Here” widget that includes a welcome message and a prominent “Start Here” button. This technique also works well because it grabs the attention of people scrolling through the home page of your site. You can even consider making your “Start Here” section the home page of your site. The Copyblogger home page orients people to the site’s offerings. Your “Start Here” page can create the perfect welcome for your new visitors and help them make the most of your site and your offerings. Take some time today and outline the information new visitors need to know about your site when they first arrive. Then draft an original, friendly, and educational “Start Here” page. Publish your “Start Here” page as soon as possible. Your prospects will be grateful for the warm welcome! Have a favorite “Start Here” page? Share it in the comments section below.